Cartoon animations are very effective for delivering a message to the audience. Due to their likability and entertainment they can easily capture and keep the audience’s attention and, contrary to standard commercials, are almost automatically spread around the internet. The key to a successful cartoon animation is to bring action and emotion along with the message. The most common mistake about company cartoon presentations is that they focus only on the dry and boring teaching resulting in a character talking for minutes to the camera without any eventful action ever happening. The Svega cartoon animation was done for a Swiss web agency. Its purpose was to be a company presentation explaining their 5 services. The first step was to transform their existing logo into a 3D character, maintaining its main structures and proportions, and adapting it into a real world scale. The movie had to be composed of 5 scenes of 1 minute each in a way that they could have broadcast each animation separately month after month and as a whole at the end. What we considered to be the most important aspect was the ability to create an amazing and unique scenario. We absolutely wanted to avoid another cliché office animation where a character is sitting at a desk and talking to the camera. At this point our main question was how we could visually represent the abstract concept of an internet service agency that creates websites, manages their content, keeps them updated, reliable, reachable, and fast. The perfect solution turned out to be a floating city spaceship. Its futuristic design was a symbol of being up to date with the latest technology, the concept of flying stood for its worldwide presence, the city concept was ideal to allow the character to race with a go kart among buildings giving a strong sensation of speed. Having streets was a very convenient element and a great solution to display the final Svega logo at the end of the animation by turning off all building lights, but keeping the streetlights. Once this main concept had been established, the next serious challenge was to design the city. This could not be done just by considering its aesthetic beauty. It also had to be arranged in a way that would allow the streets to shape the Svega text logo from the bird’s eye view and at the same time the major buildings had to be evenly spaced out so that the character could reach them within the maximum of 30 seconds from one animation to the next. Last but not least, creativity was extended to small details and designs that are not immediately obvious, but give the animation a unique and elaborate touch. When the question emerged of how we should welcome the client in the city, we immediately thought of the association between “Welcome to la Svega” and “Welcome to Las Svegas” and thought this could be an interesting coincidence to play on. From the actual Las Svegas welcome sign we simply had to shift an S and the last piece of our design masterpiece was complete. The first thing we care to understand is the client’s general vision and whether a cartoon animation would be its best implementation. We discuss and figure out how his ideas could be translated into an interesting cinematic and storytelling animation. Before taking a pencil and paper the very first thing we do is to research the specific market. We closely look at factors such as what animations and which positive features competitors have, and what shortcomings we can improve and surpass. Since the design industry is constantly evolving, we pay attention to designing our visual and acoustic contents according to the latest trends. Great design doesn’t come from the pencil, but from the mind. This is why before doing a pencil drawing storyboard we develop a concept. This phase serves both us and the client to agree on a general mood and direction of the video where basic principles like music, events, and story are determined. After having agreed on the concept it is time to draw the ideas on paper. The storyboard is simply a sequence of drawings that visually represent what is happening in the animation. Design may come before, after, or during the storyboard process, depending on what’s more convenient according to the type of project. For example, if the character is a bird, it doesn’t only affect design elements like objects, streets, houses, etc., but also the animation itself, such as that he won’t need to take an elevator to reach the top of a building, but rather a landing runway. For this reason design and storyboard are usually worked on simultaneously. Once design and storyboard is defined, the moment to open our 3D software finally arrives. All models are created including characters, backgrounds, cities, streets, rooms, etc. The client will be shown some test renderings in order to approve this step. After having all 3D models the project is taken to the next step of animation. Here we animate all cartoon characters in their environments. The client is given a greyscale video of the animation where he can see the complete animation in detail, but without rendering of colours, lights, and shadows. This step is used as a confirmation from the client before we send the project to render farms. Here is where the client’s interaction ends. This phase is all about setting up lights and programming the render software. This purely technical procedure is the key element that will determine the visual quality of a CG animation. Both our rendering skills and Hollywood standard software ensure the client’s total satisfaction with the end result. 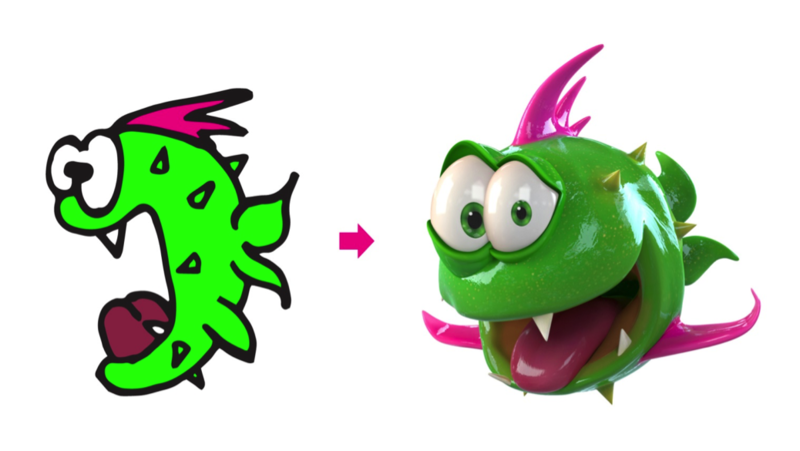 How to transform a 2D logo into a 3D cartoon character?